If you’re planning your first trip to Kyoto, Japan, I’ve put together a 4 day Kyoto Itinerary, just for you! 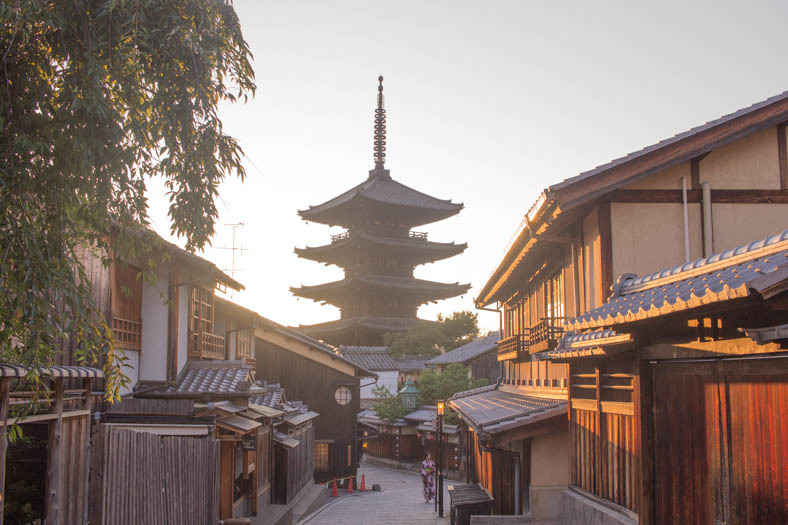 If you think of Tokyo as a modern city, Kyoto is like it’s older, more traditional sibling. If you’re after cultural experiences – temples, old architecture, beautiful Japanese gardens and Shrines, well Kyoto is for you. So read on for my 4 day Kyoto Itinerary, filled with ideas of places to visit in Kyoto! First days always have the potential to be time wasters if you don’t plan. If you’re anything like me, the first day is always filled with “oh noes, what do I do now?? ?” after I’ve dropped off my luggage at my hotel or hostel. If this is you too, I’ve put together a half day itinerary to make settling in easier! Downtown Kyoto is your stop. Filled with arcades, museums, and laneways for you to explore, downtown Kyoto is also a great spot to explore on a rainy day. 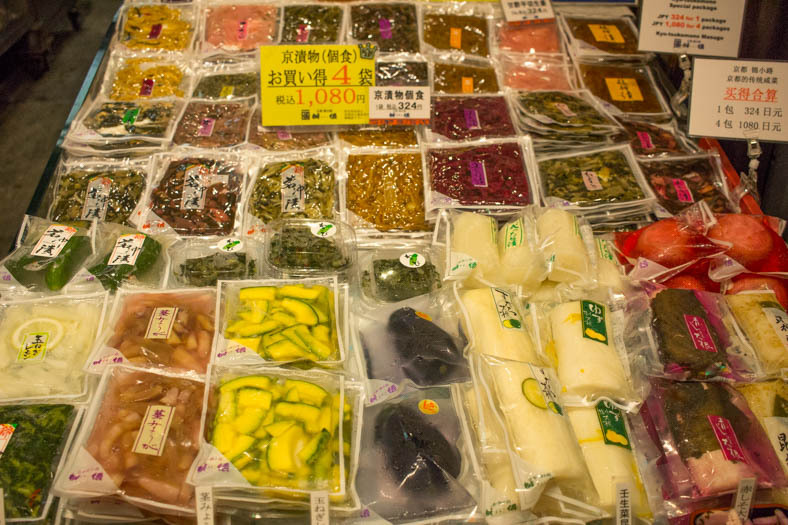 Markets are always a great way to experience the culture of a country you’re visiting, and Nishiki Market is no different. I loved browsing the different foods and fresh ingredients. It was lots of fun to browse the stalls here. The market is undercover, so if it’s raining, this is a great place to spend a bit of time! I stayed just down the street from this area, so it was my go-to area for stocking up for souvenirs. The Teramachi Shopping Arcade is a little touristy (think tourist stores and places you can stock up on cheap knick-knacks). It’s a great place to spend some time if you like shopping, but you don’t want to step foot into a large department store. The Fushimi Inari-Taisha Shrine is one of the most well-known spots in Kyoto for tourists. This Shinto Shrine is dedicated to Inari, the Shinto god of rice. It’s famous for the thousands of torii gates, donated by individuals and local businesses. It costs 400,000 yen (approximately $3,500 USD) for a small sized gate, and the cost increases to over one million yen (roughly $8,800 USD) for a large gate! When visiting you may spot fox statues on the shrine grounds – this is because foxes are said to be Inari’s messengers. This shrine is one of my most favorite places in Kyoto to visit – the rows of torii gates are a sight to behold, and the hike up Inari mountain is peaceful and has sweeping views of Kyoto. You can spend a couple of hours climbing Inari Mountain, so it is worth visiting as early as possible to avoid the crowds and crowds of tourists. Opening hours: 24 hrs – some people even come at night! 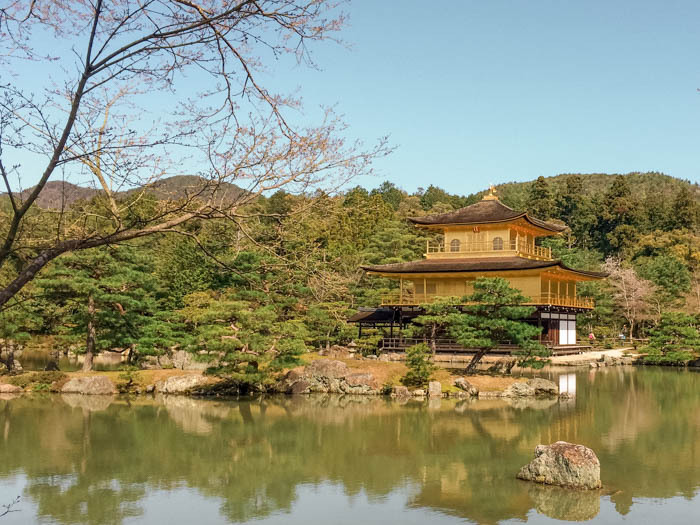 No visit to Kyoto is complete with visiting the Kinkakuji Temple or the “Golden Pavilion.” This Zen temple is famous for being covered in gold leaf and overlooks a large pond. The temple has been burned down a couple of times during his history, twice during a civil war and again in 1950 when it was set on fire by a fanatic monk. It was rebuilt to its current structure in 1955. I’ve visited the Kinkakuji Temple twice, and am always surprised at how beautiful and grand the temple is. The gold covered temple is a sight to behold, and I’d recommend first-time visitors to Kyoto to visit! It’s hard to avoid crowds at the Kinkakuji Temple, as this is a ticketed location. Your best bet is to visit as soon as they open, or a bit before they close. Off-peak tourist seasons are best, and avoid weekends if possible! The Arashiyama Bamboo Grove is arguably one of the most photographed spots in Kyoto. The general area of Arashiyama is very popular, as the surrounding area has many beautiful shrines and temples. If you’re keen on photographing the Arashiyama Bamboo Grove, make sure you visit early in the morning and pack insect repellant if you’re visiting in the summer. The crowds start to pick up at 9-10 am! Also, make sure to avoid visiting during public holidays or weekends. Arashiyama Bamboo Grove is incredibly popular, amongst local Japanese and tourists alike! A short walk from the Arashiyama Bamboo Forest is the Tenryuji Temple – one of the most famous temples in the Arashiyama district. This temple is registered as a world heritage site and is also the head temple of its school within the Rinzai Zen sect of Japanese Buddhism. The reason why most tourists visit, however, is its beautiful gardens which are still in their original form. Make sure you check out the pond with the backdrop of the Arashiyama Mountains! Cost: Garden entry is 500 JPY (approximately $5 USD) for adults / 300 JPY (approximately $3 USD) for students, if you’d also like to visit the Tenryu-ji Garden and Buildings too, it’s an additional 300 JPY ($3 USD). Location: You can find a couple of boat rental spots if you walk from the Togetsu-kyo Bridge on the north side of the Hozu-gawa River. You can definitely spend an entire day in the Arashiyama district. My recommendation would be to pick another temple you’d like to visit (there are SO MANY to choose from!) or visit the Monkey Park Iwatayama. There are also some great food options in Arashiyama too – our favorite was Arashiyama Yoshimura (located along the river) the lines can be long, but the soba is 100% worth the wait! Most people who visit the Kiyomizu-dera remember it as the beautiful temple with a grand wooden stage looking out across the hillside. This temple is not only beautiful but also attracts many visitors seeking views of fall leaves and cherry blossoms. This temple is one of the most visited temples in Japan and is also a UNESCO world heritage listed site. My favorite part of visiting Kiyomizu-dera was visiting the Tainai-meguri. This underground area is dark and symbolic of entering the womb of a female bodhi­sattva. Make sure to follow the handle in the darkness, and make a wish by spinning the rock. 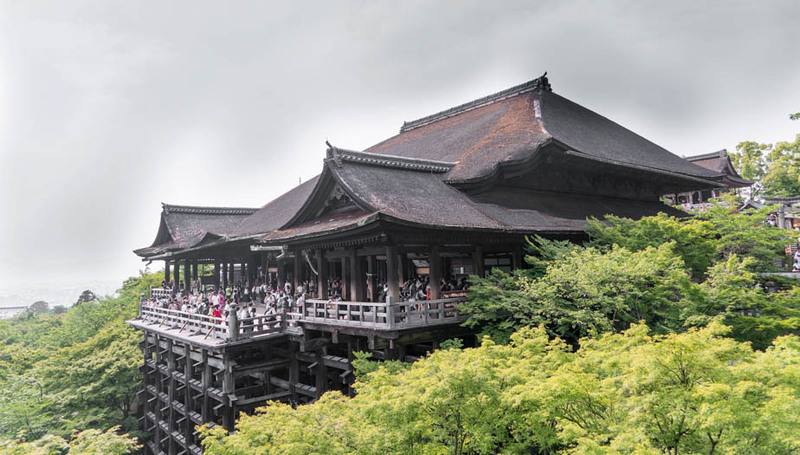 Note: Kiyomizu-dera is undergoing construction at the moment, and part of the main hall is covered up. You will still be able to visit (construction started in Feb 2017 and will finish March 2020), however, if you have plans to photograph the main hall, you may not find what you expect when visiting. Similar to Kinkakuji temple, this is a ticketed tourist site, so it will be hard to avoid the crowds. If this is a priority, make sure you visit as soon as they open or a bit before they close. This was one of my unexpected highlights in Kyoto! I visited on my third trip to this city and was so glad I did. The museum has free entry (bonus for budget travelers!) and is filled with bucket loads of information about Japanese arts and crafts. You’ll learn how the material of kimonos are made, there are even live demonstrations, and they have a great gift shop filled with traditional Japanese crafts! This museum was one of my highlights of Kyoto. Gion is famous for being Kyoto’s geisha district. A short walk from the Higashiyama District; the area is perfect to visit in the evenings. Filled with shops, restaurants, and teahouses, this is where Geisha and Miko (Geisha apprentices) entertain. Architecturally, the streets are filled with narrow wooden houses and lit by paper lanterns in the evenings. Gion comes alive in the evenings, which is when other tourists and visitors to Kyoto also flock to the area. Remember: If you spot Geisha or Miko on the street, please be respectful! Don’t touch the Geisha, be respectful when taking photos and try not to bother them when they leave/enter their place of work. They are people too, and deserve respect! 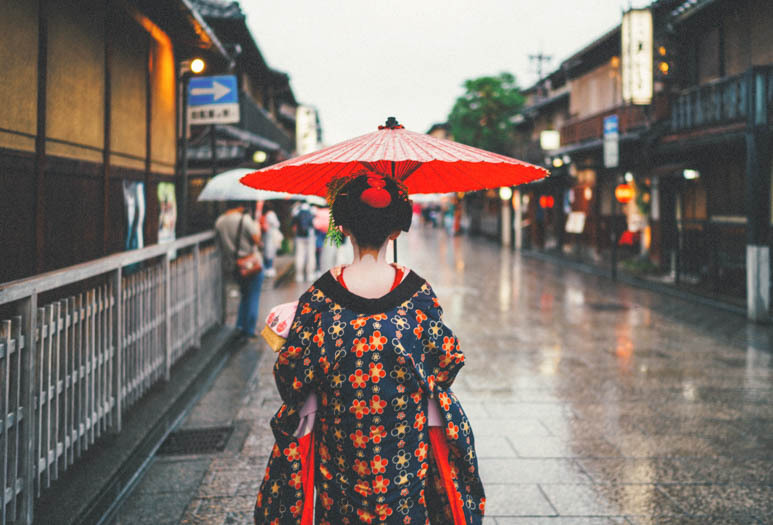 If you’d like tips and advice for seeing Geisha during your time in Kyoto, make sure you check out this guide from My Ticklefeet blog about seeing Geisha in Kyoto! If you’re visiting Kyoto during the busy season of Spring, I’d highly recommend you book your trip ASAP! 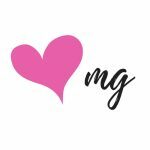 To help you, I’ve put together a list of suggested accommodation options, based on location and categorized by travel style. This capsule hotel is just a 4-minute walk from Kawaramachi Train Station or an 8-minute walk to Nishiki Market, making it super convenient to travel in Kyoto. Not for the claustrophobic, the capsules here almost look like spaceships! Each capsule also comes with power outlets for your phone/electronics and free wifi. This guesthouse is just a 14-minute walk from the famous Kiyomizudera Temple and is super budget friendly. 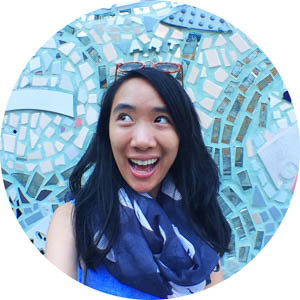 If you’re traveling on a budget with a partner or friend, I’d highly recommend this option. The nightly rate shared between 2 people is equivalent to a night in a hostel or capsule hotel. If you want to treat yo’ self (without going broke), the Kyoto Granbell Hotel is a great option. This hotel is only a 3-minute walk from Gion-Shijo Subway Station or an 8-minute walk to Yasaka Shrine, making it a super convenient base when you’re in Kyoto. If you want to see more of the iconic Higashiyama District, this is a great place to base yourself. If you’re celebrating something special (like a birthday or anniversary), the Tomoya Residence Hotel is a great option in Kyoto. The architecture here is incredible – it’s a mix of modern and Japanese influences. I’d love to hear from you – are you planning a trip to Japan? Or have you been to Kyoto previously? 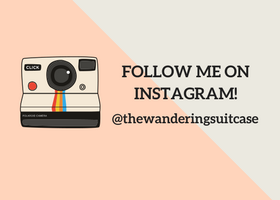 Leave me a comment and let me know if you have any questions! Heading to Kyoto? Book your hotel room now! Don’t forget to pick up a guidebook: This is a great Kyoto guidebook and this is my favorite Japan guidebook! We are planning to head to Japan later this year so your post is perfectly timed for us! Thanks for all of the tips. I’m so glad to hear you found this useful Lisa, and hope you have an amazing trip to Japan! Did you have to rent the rowboats in advance near the Tenryuji Temple or did you get them on the spot? Also, how far was Uji by train from Kyoto? We’re only in Kyoto for 4 days but knowing about a day trip option won’t do no harm. You can definitely rent the row boats on the spot in Arashiyama. From memory, they take cash only so make sure you have some on hand! Uji is only about a 20-30min train ride from Kyoto. It’s so close you could even just visit for the afternoon if you are tight on time! Hope this helps and feel free to reach out if you have more questions 🙂 I hope you have a wonderful trip to Japan! This is great! We are taking my three kids to Japan in April and hadn’t done any planning for our three days in Kyoto. I’ve only been to Tokyo, so I am very excited to see something more old-world. This will be so helpful!